Recently I mentioned to a friend that we were looking for people to build a bike, a dog-proof chook fence and an irrigation system. Said friend not only knew someone to do all these jobs but it was the one guy to do the lot! As it turns out, Rob, or Mr Fixit as he has become known in our household (apologies to Stomper Girl), won’t be building a bicycle for The Dutchman after all, but he could have. 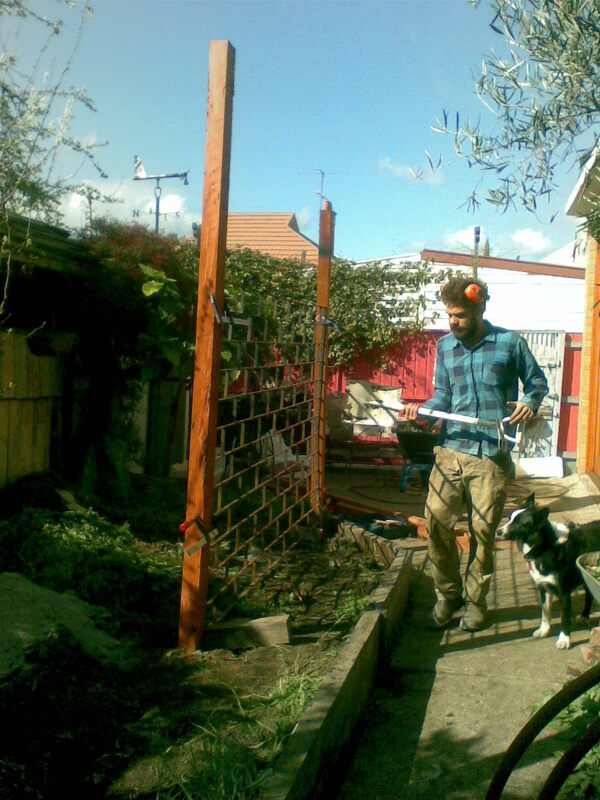 He is building a new Boef-proof chook fence, a necessary upgrade after certain infamous events earlier this year. 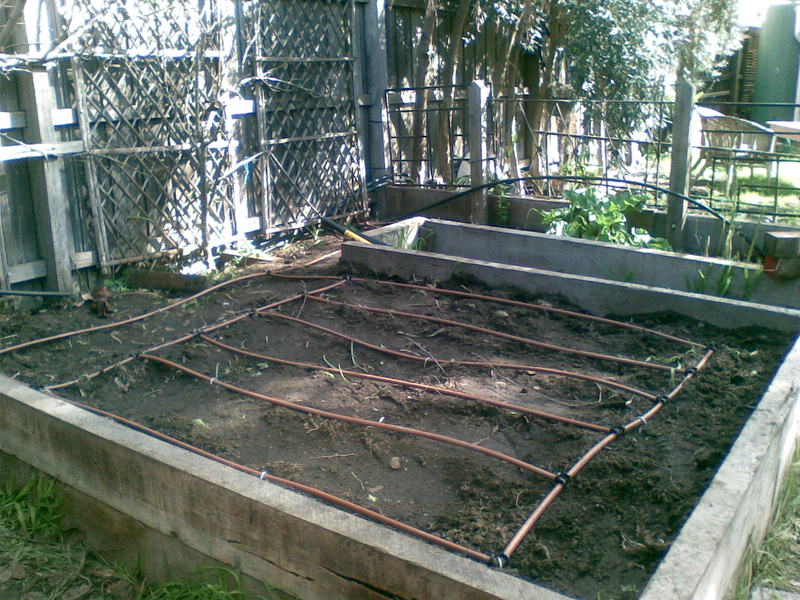 He is also building an irrigation system for our raised veggie beds. We’ve been using our veggie beds for a few years now and I just can’t face one more summer of endless hand-watering. Now that we have 13000 L of water in our tanks an irrigation system is next on my wish-list. 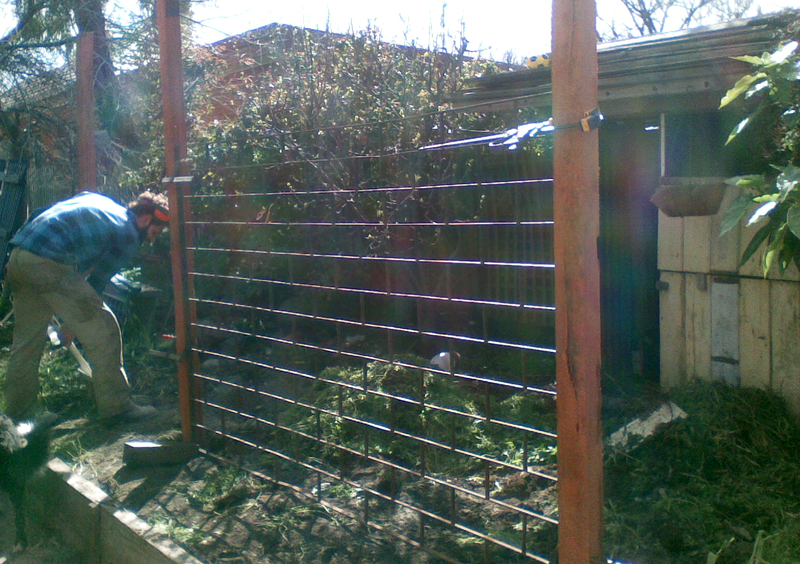 Our chook fence is being built using a nice iron screen I found in a skip, split sleepers and other bits and pieces. Great progress has been made in just a few days and it looks like we may be ready for spring after all. Mr Fixit also brings Stella, his kelpie-cross, with him and she provides Boef with hours of entertainment and company. Everyone is happy! I’m glad you put pictures otherwise I’d have been quizzing my Mister Fixit as to why he was doing all this stuff at your house. I kept trying to think of another name for him but there was none better!